Remember the Nokia Lumia 510 which went on to appear in China back in September? Well it seems that the 4-inch Lumia 510 is heading to India. 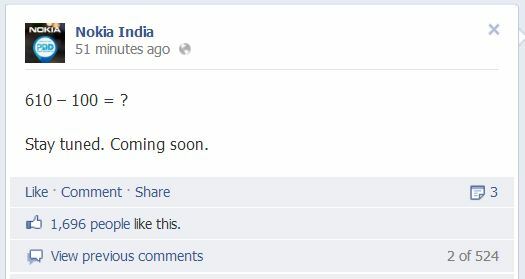 Nokia India has teased the Windows Phone smartphone on its official Facebook Page as you can see above. If Nokia is planning the Lumia 510 for India, then the smartphone is expected to arrive with some decent specifications for an entry level smartphone which includes a large 4 inch screen and the device is expected to be powered by an 800 MHz processor with 256 MB RAM. The smartphone has also leaked in a LIVE picture. The Nokia Lumia 610 was the first smartphone to arrive with RAM as low as 256 MB. While this could be a set back as many apps don’t work on low RAM, the price point attracts a lot of users. Nokia has an event scheduled for the October 23rd and we were expecting the company to launch the Nokia Asha 308 or Nokia Asha 309 but it seems that the Finnish giant might be planning a little Windows Phone surprise with the unveiling of the Lumia 510. Just a couple of days and we’ll have all the information officially, so stay tuned to us!